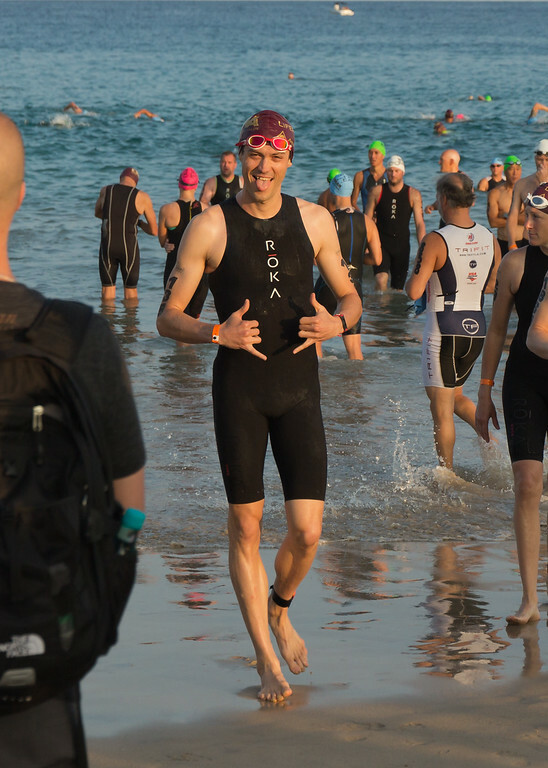 My primary goal going into Ironman 70.3 Hawaii (Honu) this year was to break 5:00 hours, and that was ultimately not in the cards. 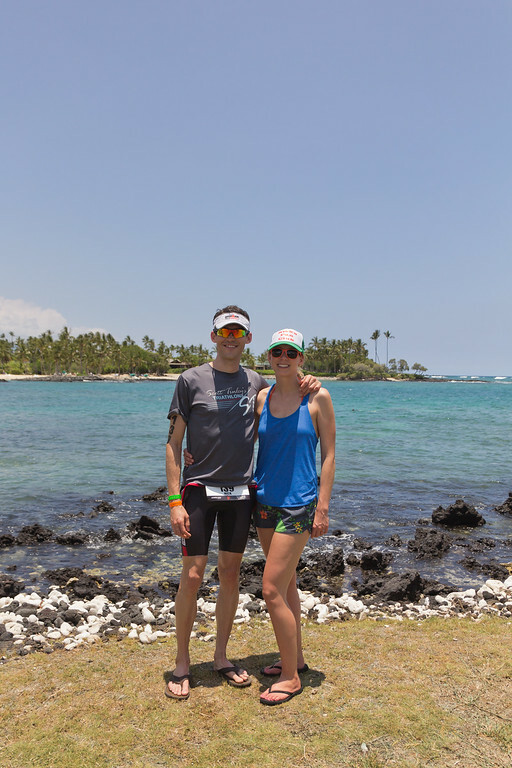 I can’t really say I am upset, as I put in a 10:00 improvement over my time last year, felt I ran as strong as I could have given the hot conditions and had an absolute blast with Sarah and the TriForce Triathlon Team. 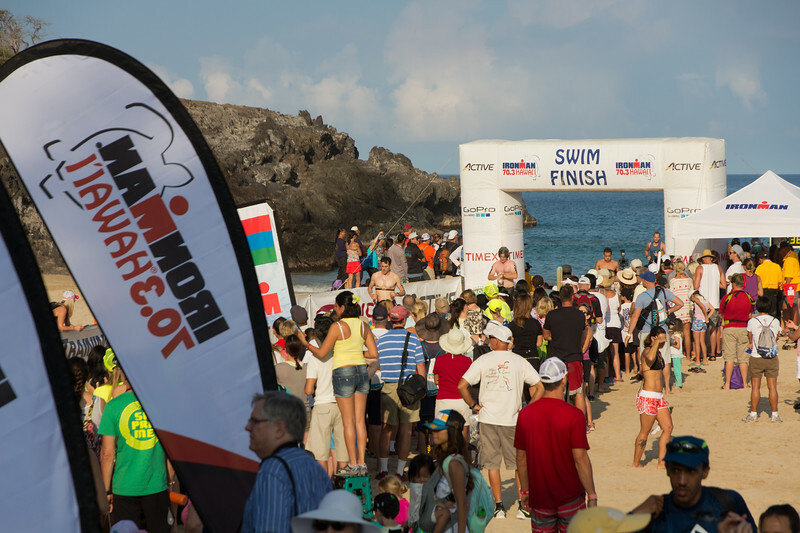 I love this race and everything about it: (i) the overall location, (ii) the fabulous course and (iii) the top-notch production Ironman puts on for this race (i.e., the great finisher’s zone and post-race BBQ). 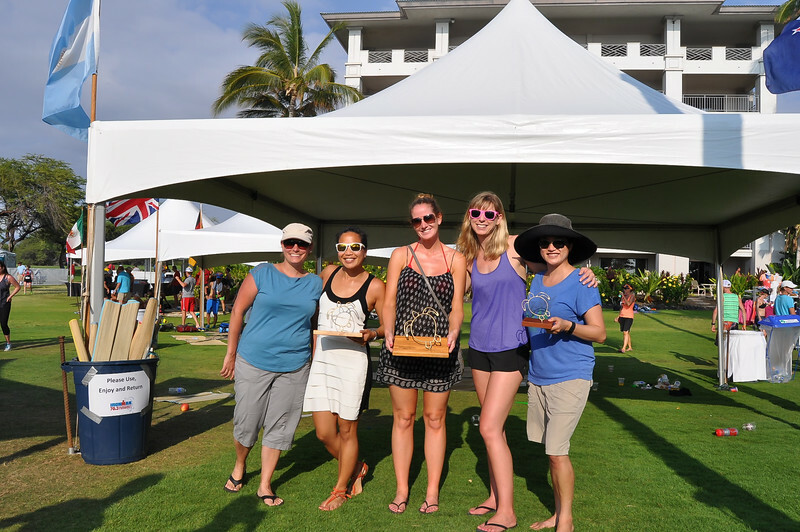 It is my favorite race to be honest – so I had a blast! In my actual race, there were some hiccups and definitely a lot of key takeaways to improve on, but all-in-all I executed on my overall race plan and ran fairly well given the heat. 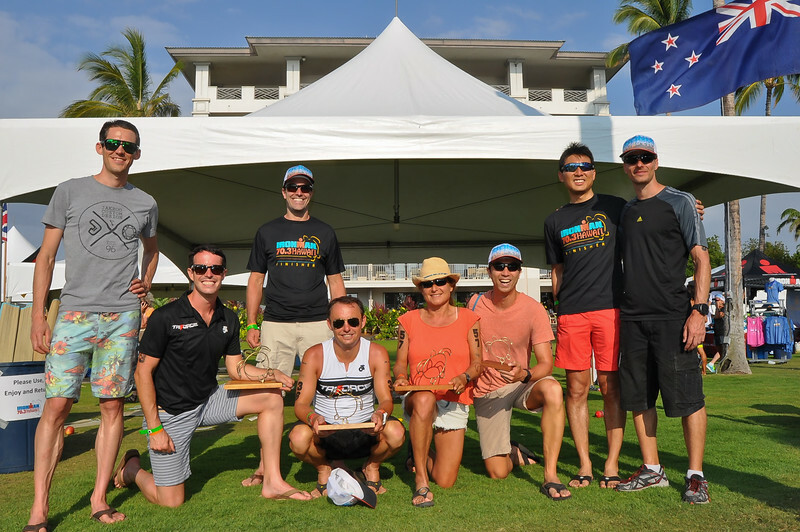 Having said all of the above, I really want to get to a sub-5:00 level for the 70.3 distance and come back next year at throw down like <4:50 in Honu! After the HITS Napa Valley Half Ironman, Coach Coady scheduled a recovery week and then a 5-week half-ironman specific build period, followed by a 1-week taper period culminating in Ironman 70.3 Hawaii. 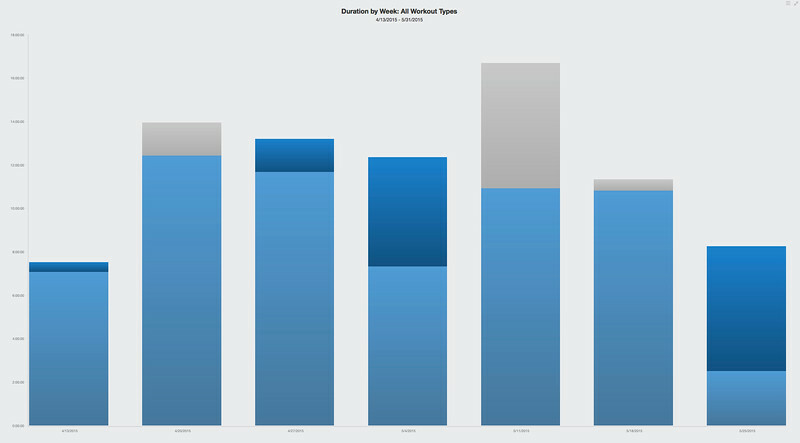 The table below has my total volume of workouts during that 7-week period from 4/13 until 5/31 (with gray indicating uncompleted planned volume, light blue completed planned volume and dark blue “excess” volume). After the first recovery week, my targeted average volume during the 5-week build period until the last taper week was 12:12 hours/week, and I averaged 11:54 hours/week. 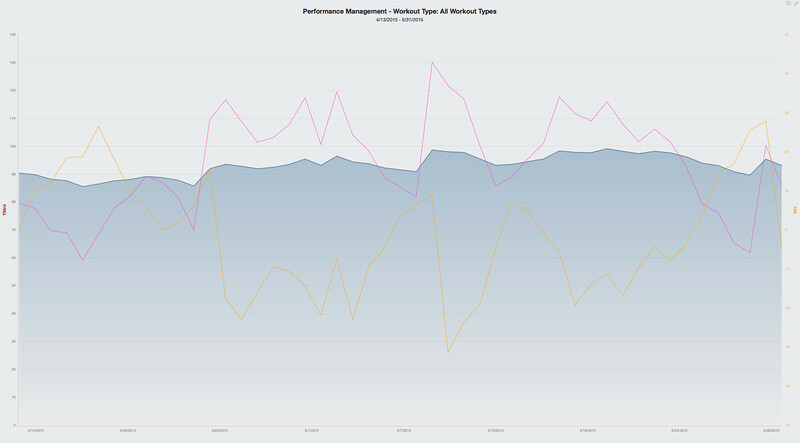 Similarly, the table below is my Performance Management Chart during the same 7-week period from 4/13 until 5/31. To put this chart in perspective, the blue portion is “fitness”, which is CTL (chronic training load) encompassing the TSS (training stress score) of all workouts older than 15 days prior on a particular day of measurement. The pink line is “fatigue”, which is ATL (acute training load) encompassing the TSS of all workouts within the past 14 days of a particular day of measurement. Finally, the yellow line is “freshness”, which is TSB (training stress balance), encompassing essentially the ratio of CTL to ATL on a particular day. To cut through everything, the goal on any race day is to maximize your “fitness” (CTL) and “freshness” (TSB). Hence, a taper period before the race where your fatigue goes down quickly (ATL), your freshness goes up quickly (TSB) and there is minimal loss on your overall fitness (CTL). You can see in the chart above my taper week that the fitness (CTL – blue) gradually goes down, but freshness (TSB – yellow) goes up rapidly with the fatigue (ATL – pink) declining rapidly. After some race check-in matters on Friday (i.e., the athlete meeting and dropping off bike and run gear), I was off to bed early Friday night for an early start on Saturday. Warm-Up – I was able to get down well before the start and get in a good warm-up. It felt good to make sure my swim skin was fitting correctly and loosen up my shoulders. 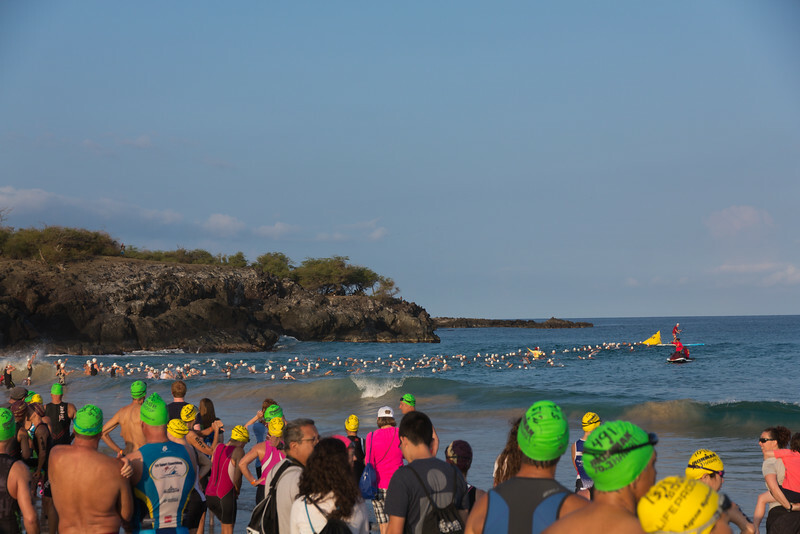 Sighting – I swam a pretty good course as far as sighting the buoys and getting off feet if I felt they were going the wrong way. Even into the sun at the last buoy, the goggles I brought for this race were tinted very well and I could make out the swim exit arch (which is generally difficult given the rising sun is directly in your face). 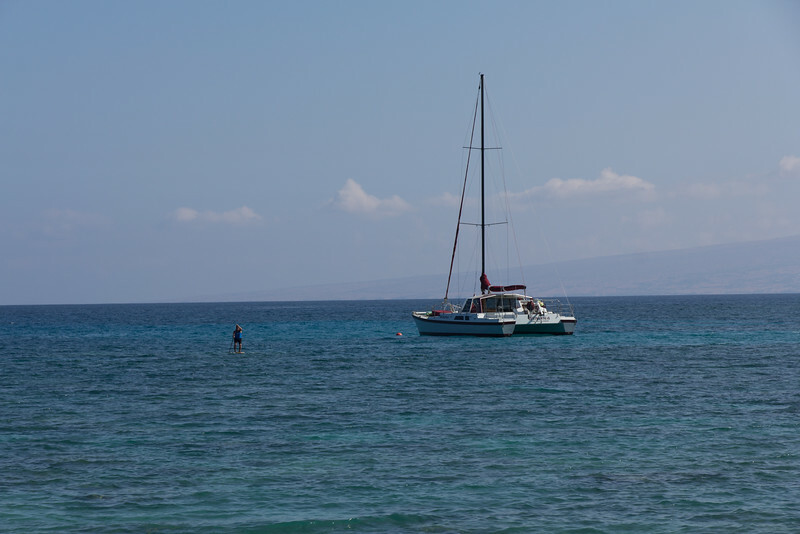 Drafting – I was pretty successful in locking onto feet about 80% of the swim. I had such success with this in Hits Napa that it became my number one goal into this swim. Accordingly, most of the swim felt very “relaxed” to me. I say this may have worked as I think I drafted off the wrong feet and swam way too slow. Although it seems swim times were generally slower than last year on this swim, I think 36:09 is much too slow for me right now at the half ironman distance. It is a minute slower than last year and my swim fitness is much stronger. 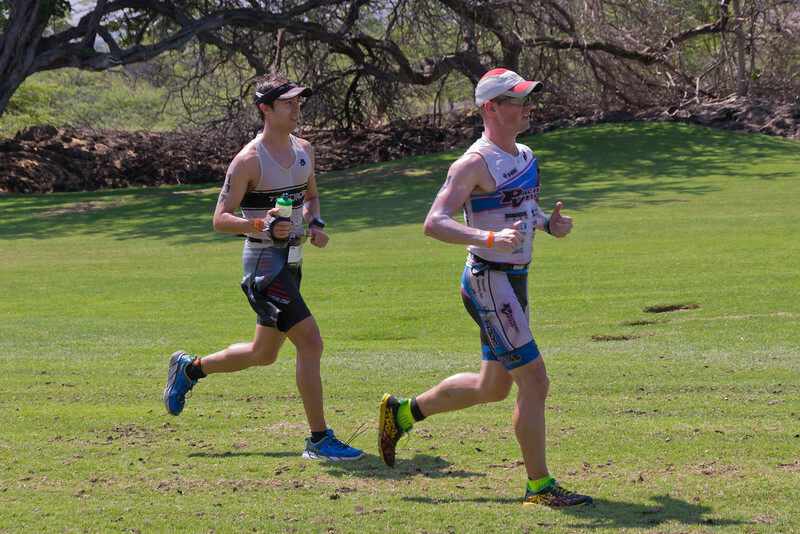 Pacing – I need to get better at open-water pacing, in particular when drafting. It is just such a difficult and “fine art” to balance swim power and effort. Meaning, I find the sliding scale of “perceived effort” hard in the swim as I tend to either (i) feel smooth and fine (i.e., under swim) or (ii) be totally gassed (i.e., over swim). I need to figure out that in-between stage. 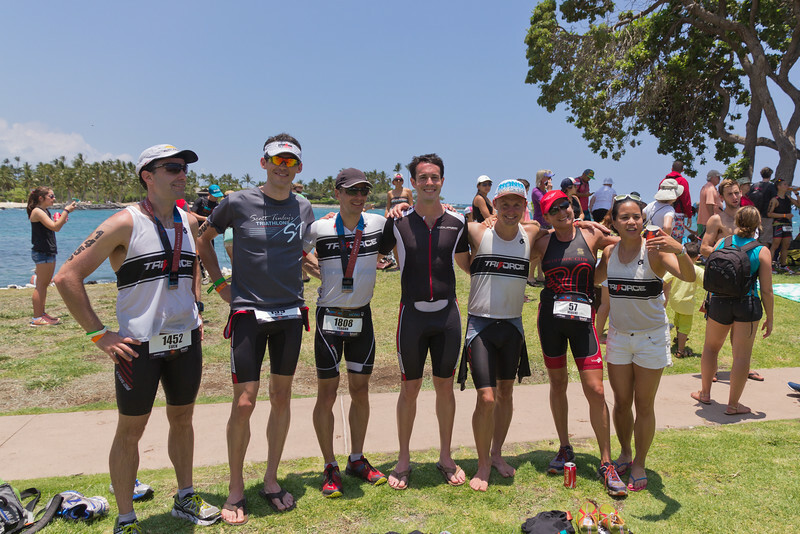 Race Plan Dialed – I had gone through my T1 plan mentally a bunch, and nailed it. 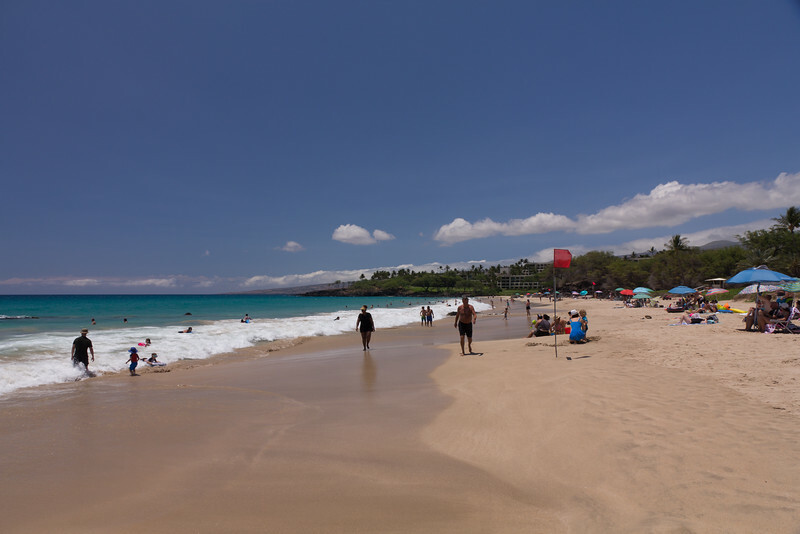 I largely walked/slow jogged up the long ramp and hill from the beach to the parking lot to get my HR down and took off the top of my swim skin during the walk. At T1, I threw it and cap/goggles in our race bag (they transport them to the finish for you), threw on the shoes and helmet and lastly put on the LG M2 Suit. Felt efficient. 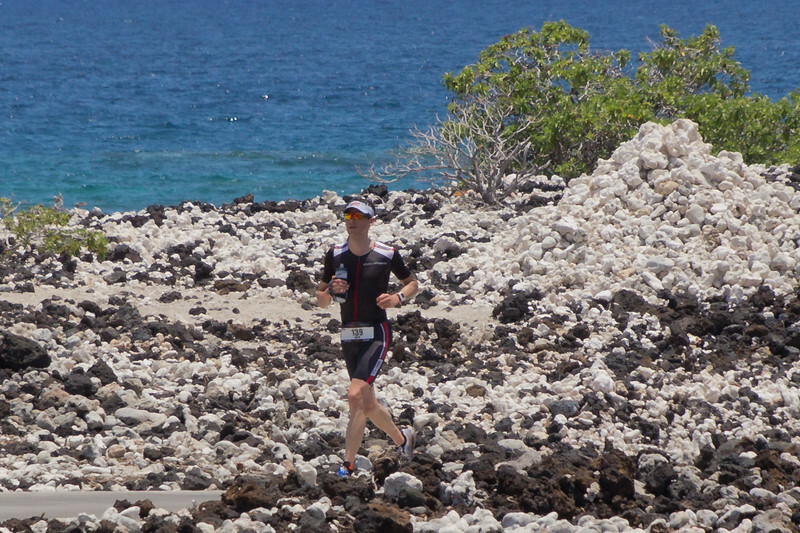 A long transition time generally as it is a long run from the beach and then out to the bike exit. Flying Mount? 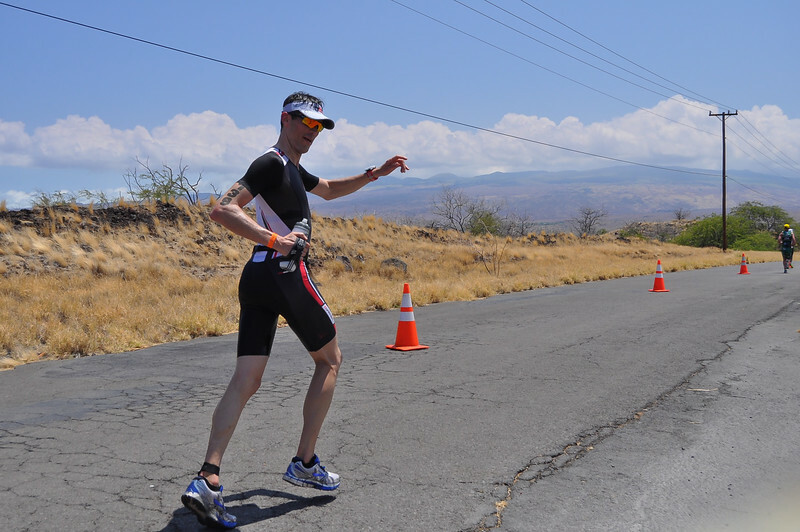 – I didn’t put this as “What Didn’t Work” as I had intentionally put on my shoes at my transition station and ran to in them to the mount line and jumped on the bike (as there is a hill immediately out of T1 on the bike). This largely worked fine. I note this as a potential area for improvement in that I need to learn how to do a flying mount where my shoes are already on the pedals and attached to the frame with breakable rubber bands, so that I can run in transition in bare feet, which is much faster than running in bike shoes with SpeedPlay cleats. I can already do a flying dismount at the bike to run transition, but I haven’t practiced the mount yet. I was probably wise to not try that new concept here with the hill. I ended up riding Normalized Power of 209w during the bike leg, and I have put a link to my TrainingPeaks bike leg race file HERE. Note, I stopped my Garmin a touch short of my actual full time pulling into T2). My time was only about 25 seconds faster than last year, which I largely attribute to a very conservative bike this year. 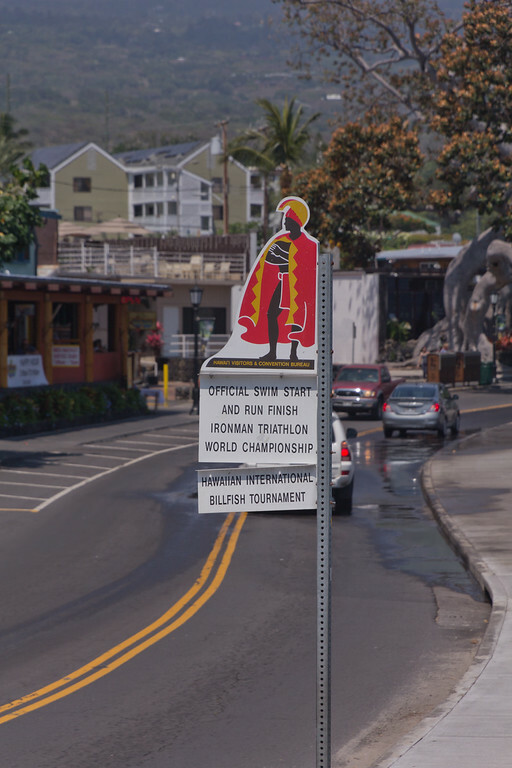 The Honu bike course is essentially the middle half of the full Ironman World Championship bike course, including the climb and descent to Hawi. 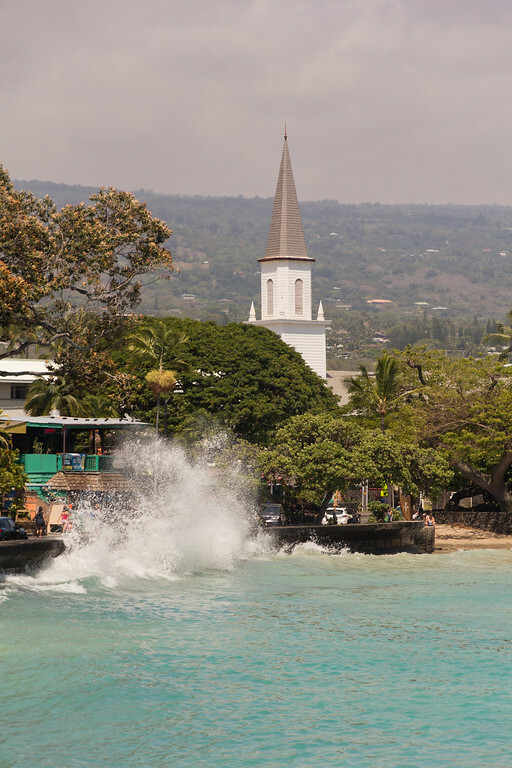 This year, there were very little winds during the ride, which was a pleasant surprise as the cross winds (particularly descending from Hawi) can be brutal in Hawaii. It was definitely a year to push the bike pace, which unfortunately I did not do. 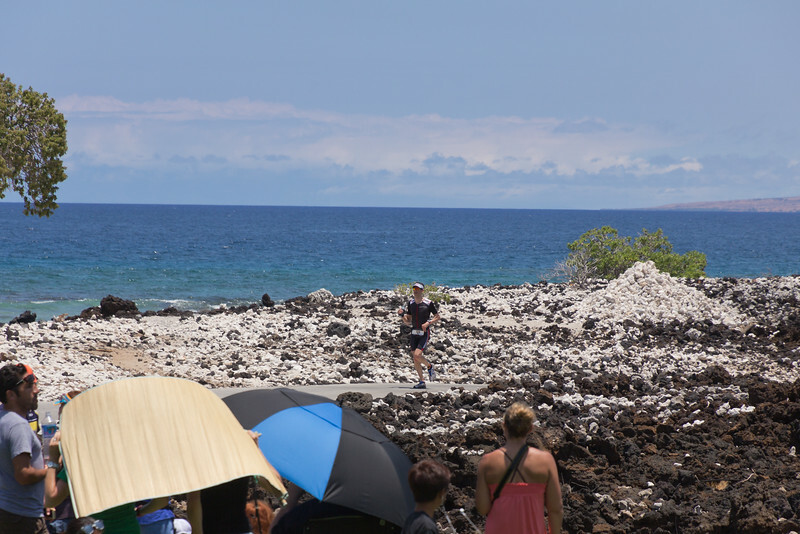 However, the lack of winds also came into plan later in the run, which was scorching hot without the winds blowing away some of the stagnant hot air in the lava fields and providing a cooling effect. My Garmin elevation profile of the bike course and a map of the ride are below. Nutrition – Per my race plan, I took in 293 calories per hour with sips from my concentrated nutrition bottle every 15 minutes. I also stuck my bottle in the freezer when I woke up on race morning so it stayed cold for largely the entire ride. Hydration/Heat Management – I was also very good about drinking a ton. I filled up my xLab Torpedo BTA bottle at least 3X on the bike (together with starting with it full) – that gave me well north of my plan of 24oz/hour with electrolytes. I also would grab a spare water bottle at each aid station and dump it over my back, neck, face and in the hole in my helmet to cool off. I think this helped out – as I could tell on the bike without the wind that it was very hot out and would be scorching on the run. Power Caps – I was pretty good and sticking to my power caps on all of the climbing on the bike. For instance, I ran my Normalized Power on the climb to Hawi in Training Peaks, and it was only 226W. That was my goal “average” for flats, so I definitely hit the hills extremely conservatively. Coasting at High Speeds – Similarly, I was pretty good about coasting at high speeds (i.e. soft-pedaling when above 25mph and coasting completely when above 30mph). Basically, I think I coasted about 90% of the descent from Hawi, and would only pedal shortly to get back up above 30mph. Without any winds, it was very easy to get aero and tuck. o For flats/normal speeds, around 225w (80% FTP), cap at 230w (82% FTP). o For moderate hills (speeds around 12-13ish mph), cap at 245w (88% FTP). o For 25-30mph on descents, back off power and stay aero. 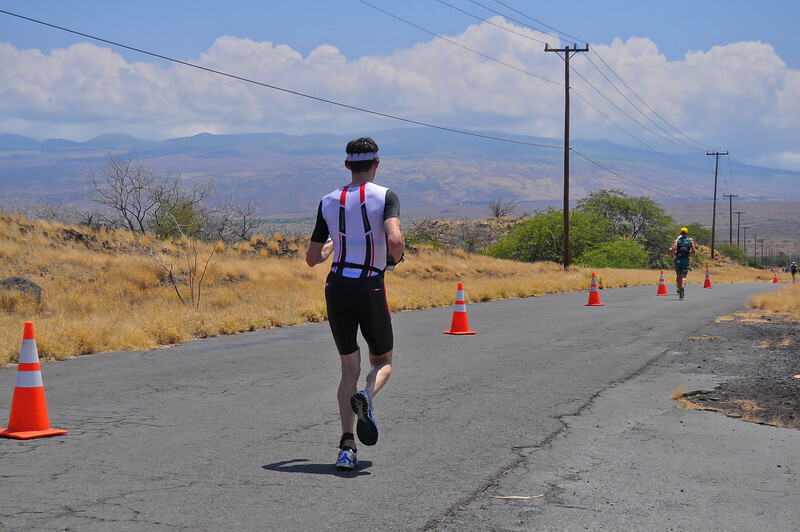 Above 30mph, coast and stay aero – except for descent from Hawi. However, I was way under for everything. My Normalized Power for the entire race was only 209w, which is obviously a bit low because of the coasting (i.e., my Average Power for the descent from Hawi was 74W and Normalized Power was 131W (just from a couple of pedaling spots to speed back up)). Where I possibly under biked was the hills. As noted above, I was very good at staying below my power caps, but I basically targeted my flats/normal speeds of 225W for everything (including hills). In Training Peaks I used the chart to select sections from every climb, and it seems that I was always around 225W NP on every climb (i.e., only 226W for the entire climb to Hawi). Under bike? Smart move? Tough to tell. Next time I race this, if I am feeling good I am going to push the hills to keep up speed on the uphill, while staying below my power caps. Meaning, for a climb like Hawi I would be with a NP near 260-280w, as opposed to 226w. 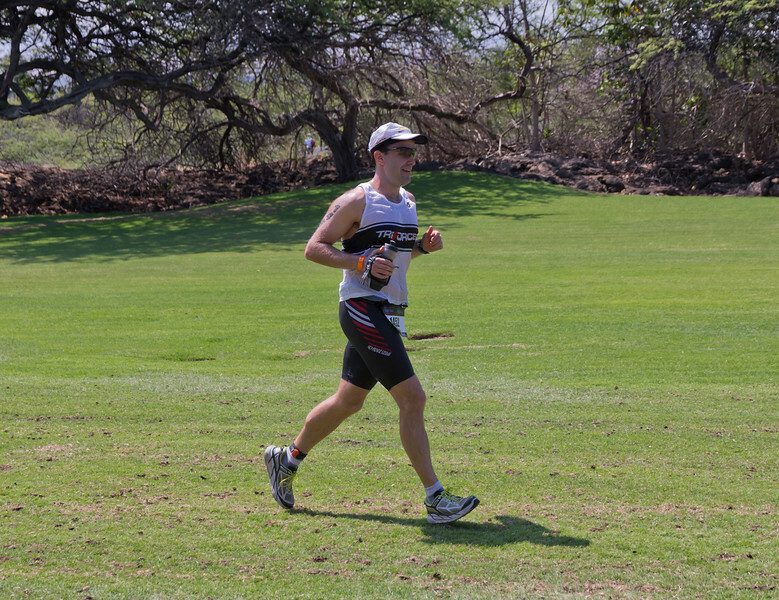 Obviously a lot depends on conditions, how I am feeling, etc… As you can see, even for a race like this where I feel I biked too conservative, holding my run goal paces was not ultimately possible given the heat. No Age Group Spots – Appears I didn’t make up any spots within my age group on the bike – at least I stuck at 41/156. Still that is crazy to me that I finished the bike in the same place I finished the swim! Largely uneventful – 2:34 was reasonably fast (albeit a touch slower than last year). 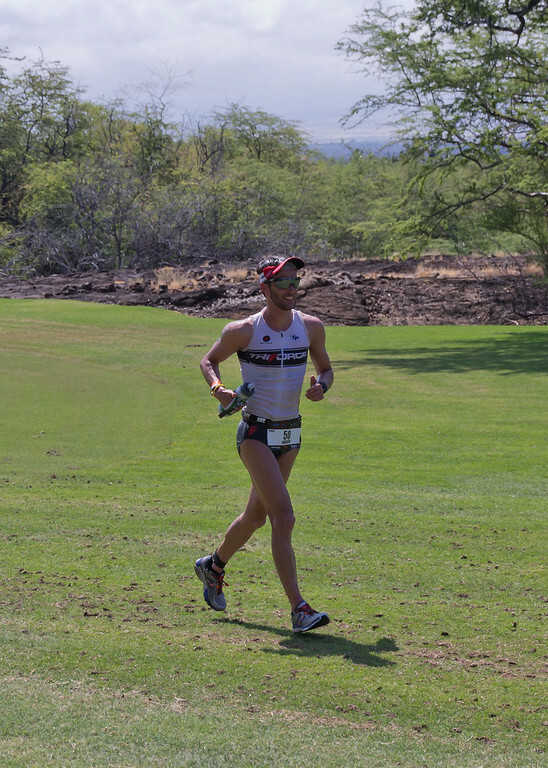 No Man’s Land in No Pass Zone – Coming up to the turn into Mauna Lani, I went above power for a bit on the last downhill to pass 3 people so I was in front going into the “no pass zone” about a mile out from T2. Once I was in there, there was no one around so that worked out great. Last year, I got stuck behind someone going very slow. Flying Dismount – Worked well – feet out of shoes and Garmin on wrist as I approached T2 and hopped of the bike while still moving. Sunscreen – I had packed some spray sunscreen, which was huge to put on. I also then donated it to the other folks in transition next to me, which I think earned me some karma points. 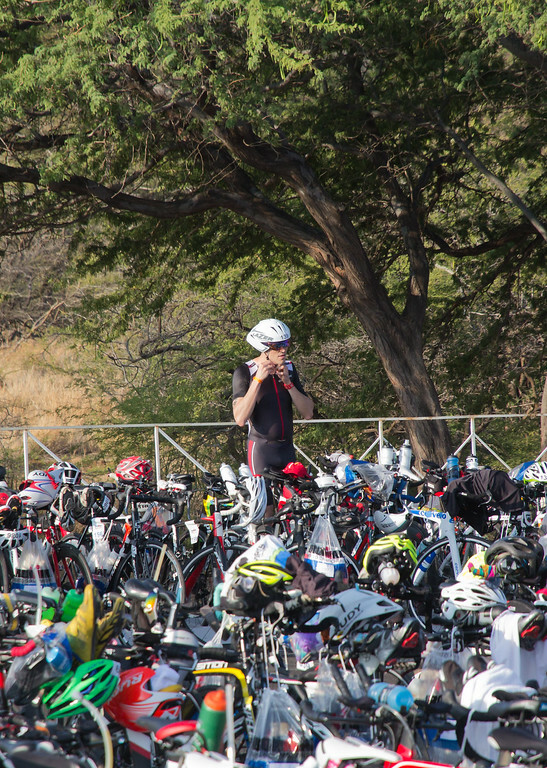 Bike Mount – This year T2 was not numbered and assigned racks, but just first in run to the back in sequemce. That worked fine in my opinion. However, I do wish they reinstated the volunteer handoff for the bike. It may sound selfish, but I found that awesome (where you handed your bike the to volunteers at dismount and they walk and rack your bike). With the new racking structure, I think it would be fine for us to run our bikes to the applicable row, but then maybe we can give them to volunteers standing there to actually rack. In my case, the racer in front of me was having trouble racking so I had to sit there for some time waiting. No big deal, though. I ended up running the half marathon at a 7:36/mile average pace, which included walking some hills and aid stations as I described further below. I have put a link to my TrainingPeaks run leg race file HERE. I’m not sure why my Garmin was faster at 0.1 mile shorter. There is no other way to describe the run this year other than HOT! I think the lack of winds just caused the run to feel so much hotter as you didn’t have the cooling effect from the winds and the hot, stagnant humid air on the golf courses and in the lava fields was just sitting there with no where to go. I was drenched by the end of the race and I don’t think I have ever finished a half ironman distance feeling as depleted as I did coming off this run. 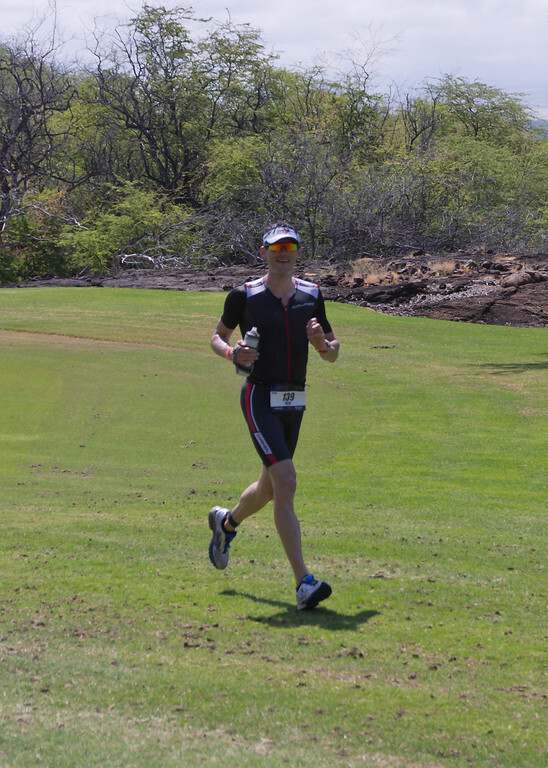 Even at HITS Napa Valley Half Ironman earlier in the year where I PRed the run leg on a much hiller run, I was not nearly as “crushed” feeling during the run and at the end as I was in Honu. 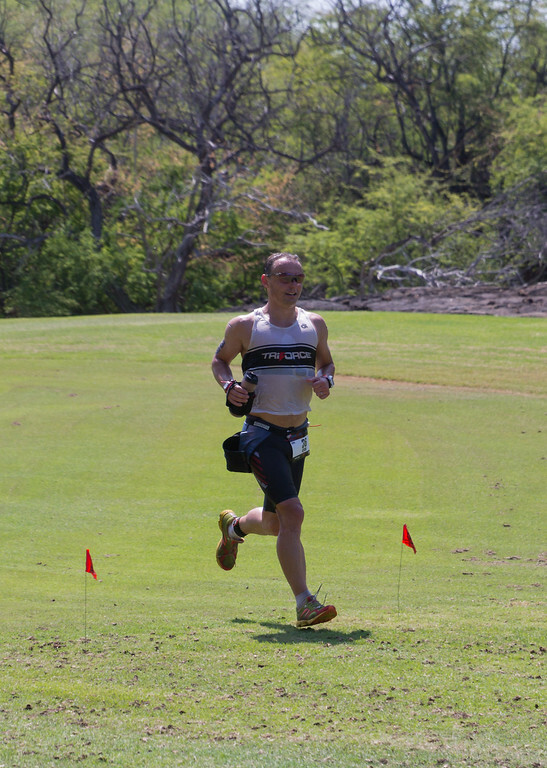 The conditions in Hawaii are a beast to race, and whether it is strong, soul-crushing winds on the bike, or insane heat on the run, they are not to be underestimated. 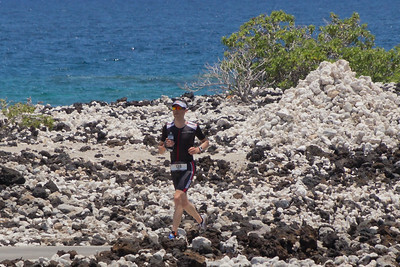 The run in Honu is an up-and-down, all-around course that is somewhat difficult to settle into a pace on. 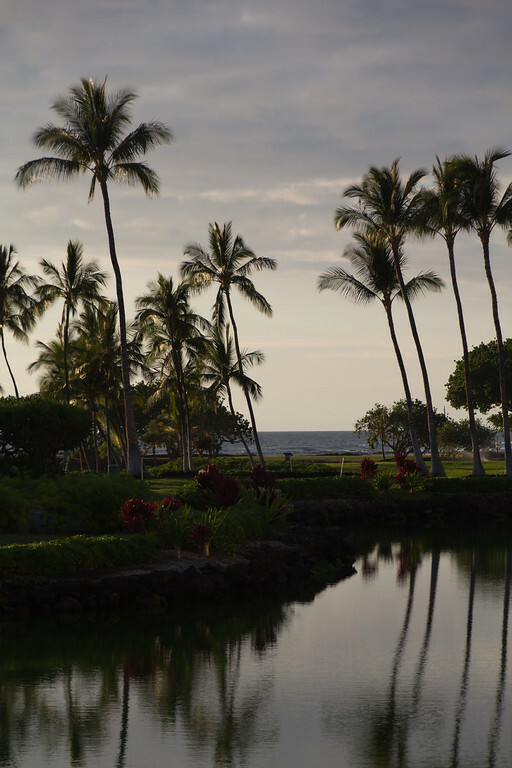 It wanders over the Mauna Lani golf courses, including running on twisty cart-paths and fairways. 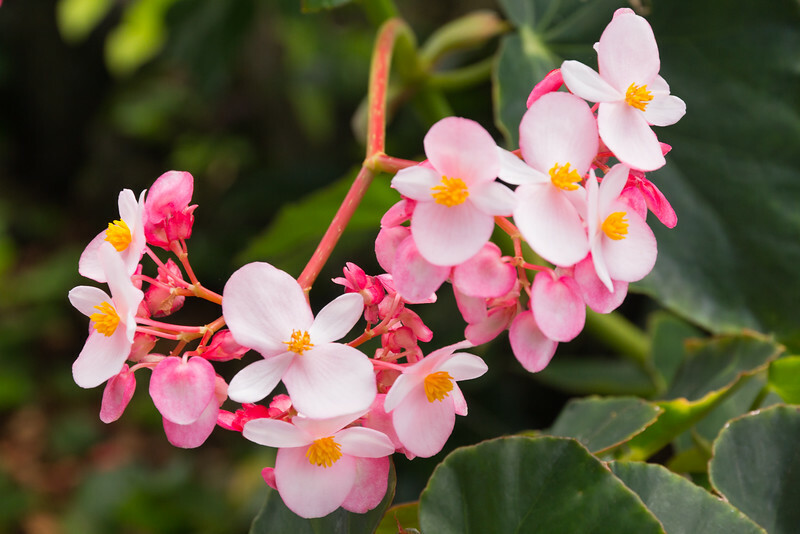 It also travels on roads through the lava fields, which are extremely hot. The “Road to Nowhere” is a particularly notorious stretch late in the race that is a long slight downhill where you can never really see the turnaround, and once you get there it is the long slog back. That stretch is crazy hot! Around Mile 2, the run course actually travelled up a golf course fairway directly outside the front door of our condo, more or less. Sarah was awesome and set up a chair out there under a tree in the shade with a sign and a stereo playing 1980s tunes and cheered everyone on. She was also in a bikini top, which I am sure gave many a male racer a big boost early on!!!! She also got some great shots of some of the TriForce team heading out on the run. Yohann, who came off a great 2:34:14 bike split and held it together with a 1:44:35 run. I caught up to Yohann at the beginning of the “Road to Nowhere” and we basically ran with each other for the remainder of the race (until he pulled ahead in the last mile). As I detailed further below, I stuck to my race plan very well for the first half of the race, but ultimately couldn’t hold my pace as I was getting so hot. I ended up walking aid stations so I could dump enough water and ice on myself. There were also a couple of short, steep hills that I walked. The scariest part was right before the Mile 12 aid station, Yohann and I ran around a corner and there was a race sitting on the middle of the path having a very serious seizure. There were volunteers there who confirmed Medical Support was quickly coming, so we kept running – but that definitely took my legs out the last mile. I really hope that racer ended up OK, as I assume it was heat related. I actually heard through the grapevine that the Medical Tent ran out of IVs after the race due to all of the racers who came in with heat exhaustion this year. 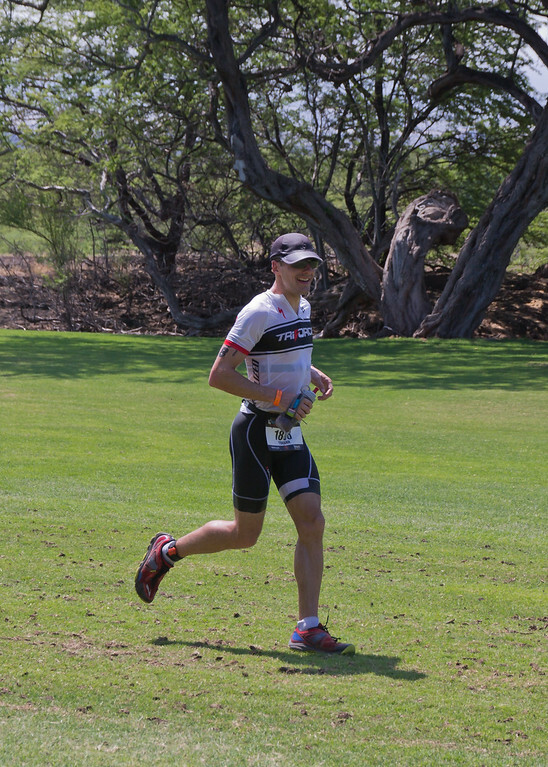 Nutrition – I filled up my hand bottle with Coke at the first aid station immediately outside of T2 and then drank sips every 5 minutes. My race plan was for 20oz/hour, providing 240 calories/hour. I honestly upped that during the run, and ended up likely drinking 20oz/45minutes. My stomach handled it well, which bodes well for the increased calories I will need for Ironman Boulder. Passing Age Group Racers – It appears I passed 25 people in my age on the run (and 116 overall). It is always a mental boost to pass people on the run, particularly when I am in a self-inflicted state of melt-down as well! Vaseline Socks – I thoroughly lined my socks with a ton of Vaseline, as I knew my feet would be completely soaked by the first aid station due to dumping water, ice and sponges on myself. This worked great as I got no blisters, despite the fact that my feet and shpes were like sponges the entire run. Heat Management – I put this as “may have” worked as I still got super hot and basically melted down at the end. I was very good at each aid station of (i) 2-4 cups of water on my head, (ii) cup of ice down the front of my suit (at my heart rate strap right above my heart) and cup of ice down the back of my suit and (iii) multiple sponges on head and neck. I even walked stations towards back half of the run (Miles 6-13.1) to ensure I did this. Immediate Post-Race Cooling Montage – Immediately after the run, after the initial shock I walked over to the coolers and dunked my head in a bucket of ice for 20 seconds = instant cooling relief. I then chugged 2 Gatorades and walked over to Sarah to lament that I didn’t go sub-5:00, but didn’t think it was possible that day. After sitting for 10 minutes, I immediately went for ice cold Kona Lager…. Me and my Number One Fan Sarah after the race. And a special shout-out to some of the TriForce spectators that that braved the heat and sun to cheer us all on! 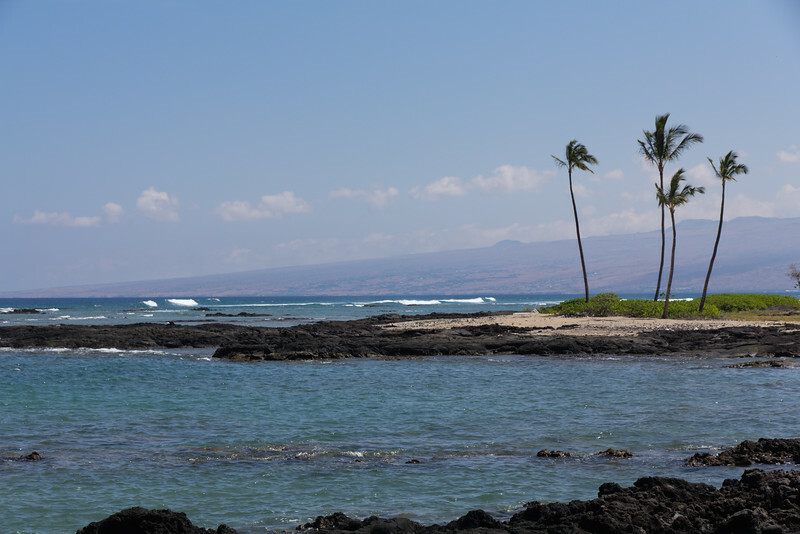 Mauna Lani beach. Click for the full-sized version. 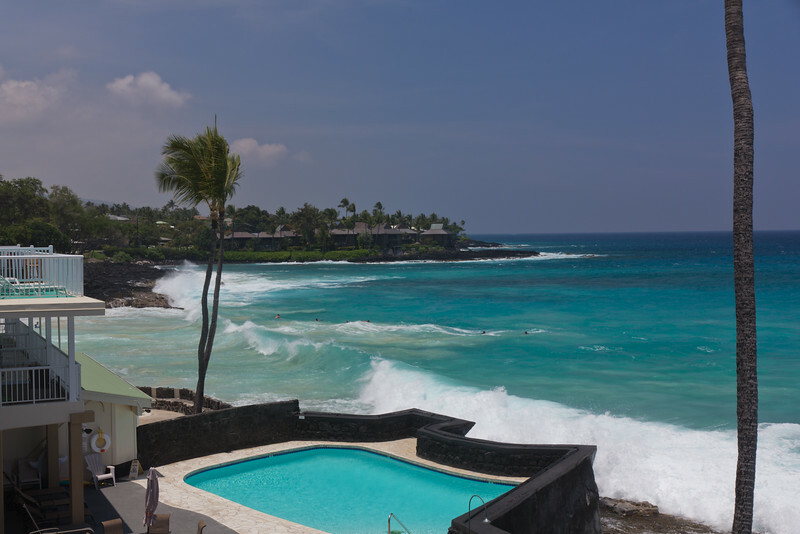 Our condo in Kona had awesome views! Big Southern Swell during the remainder of our visit! 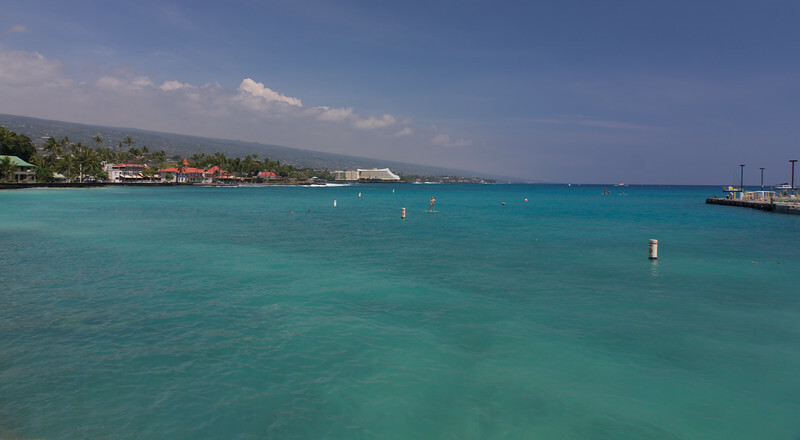 I got some great open water swimming in later in the week from the Kona Pier! 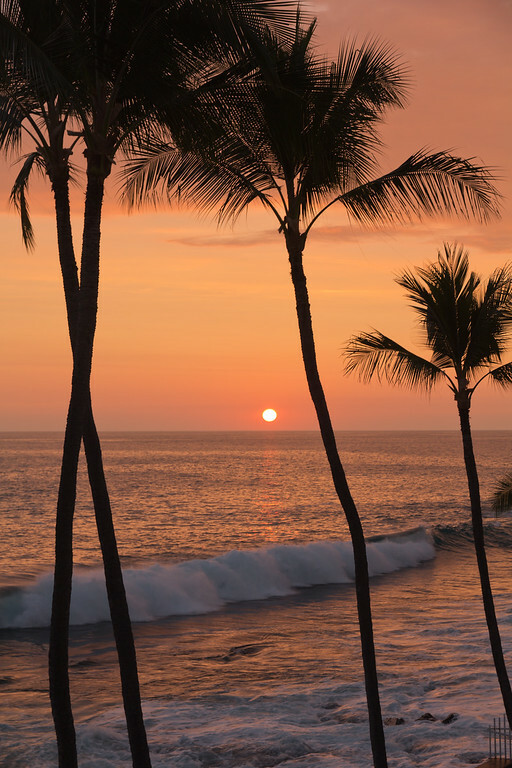 The sunset every night from our condo was incredible! 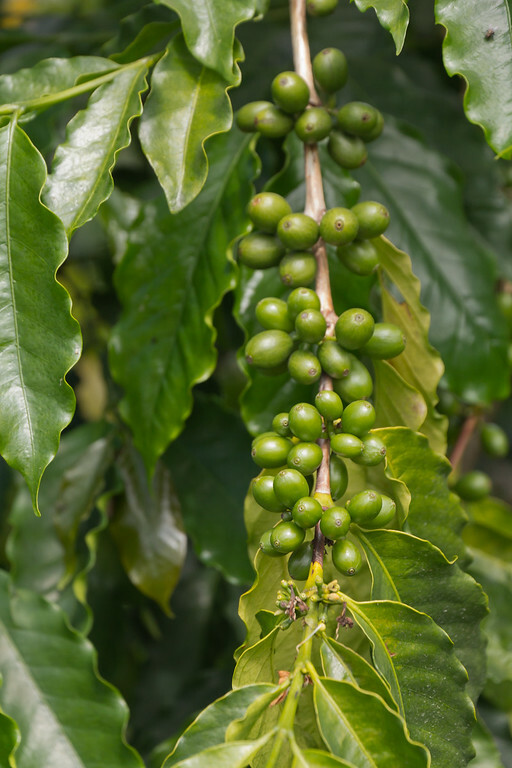 It was great to be drinking excellent Kona coffee every day – we stocked up for our trip home! 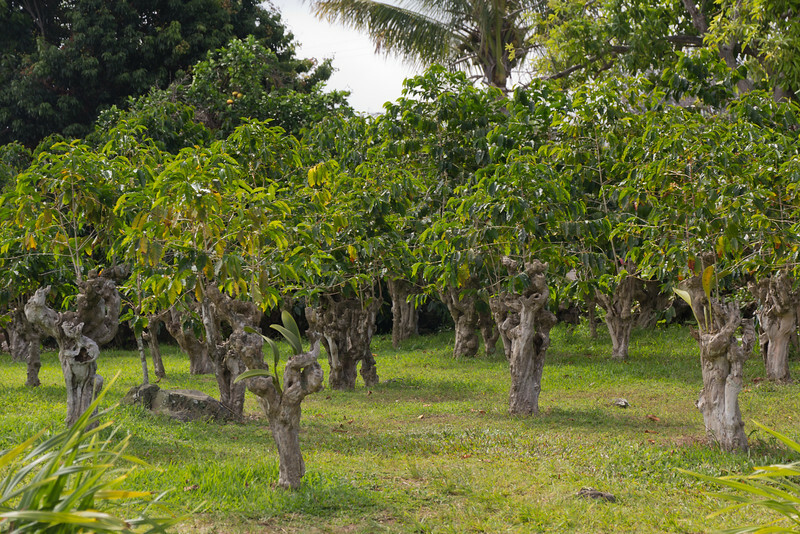 Amazing scenery and vegetation everywhere in Hawaii! This was a great race and we can’t wait to get back again! As always, it is a trip best spent with someone you love. 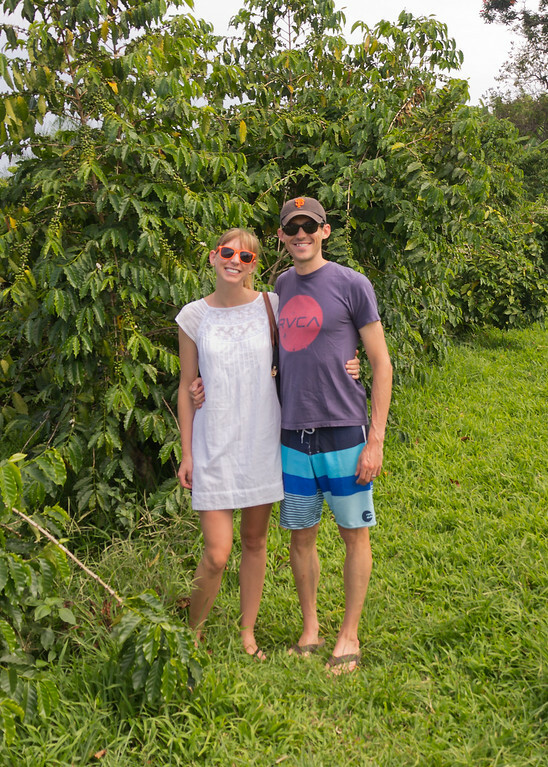 I have the best traveling companion in the World – my wonderful wife Sarah!